Wow, what a day. Glowworm’s massive one-day tournament is always a highlight, but this year topped the lot, mostly because the Sann Clan came away with Linus’s first NAF tournament win as well as the Schwing award for most illegal casualties. 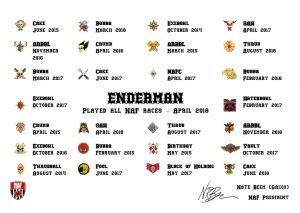 Linus (aka Enderman) also completed the 24 races today, along with Khorne and Bretonnian, becoming (I believe) the youngest BB player to do so, and possibly the youngest to win a NAF tournament, though this could well be challenged. 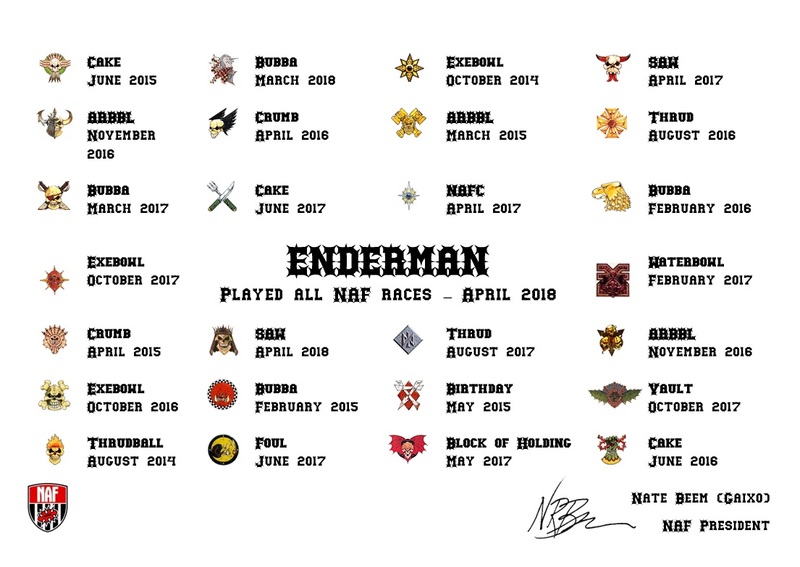 I made him a certificate to celebrate the 26, and you can download the word version here, though without Nate’s signature on it! 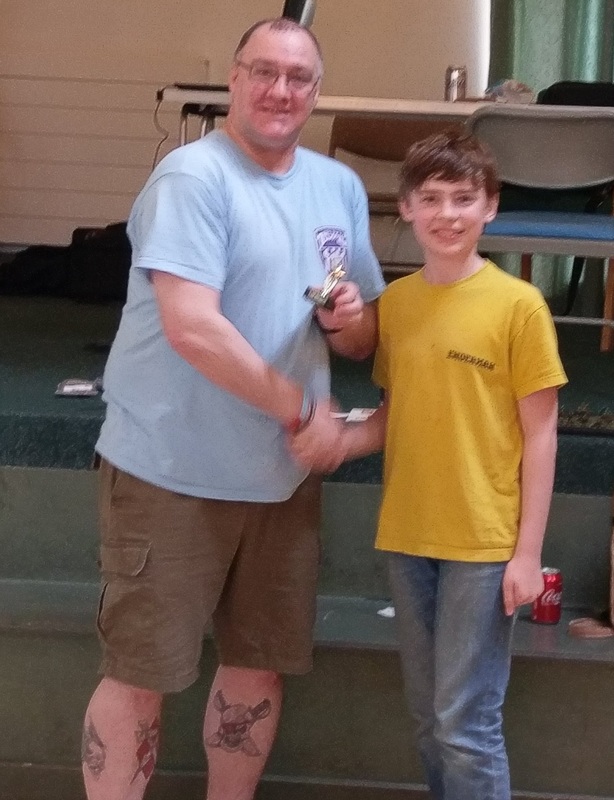 So Linus knew he was completing the 26 in advance, obviously, but then he won his first game 2-0 against DaPiranha, a hugely experienced Welsh BB coach and one of the organisers of this year’s Eurobowl/Europen in Cardiff. Happy days! Next was Ceetee, a previously winner of the Best of the Rest trophy at the NAF Championships, and a happy sequence of skulls allowed him to squeak a 2-1 win. At this stage we were hoping for him to draw Jip, who had already played Alex and me, having travelled in the car with us. Instead he drew Kismet, a SAWBBL coach (and brilliant painter!) who was using Dark Elves. Not many Dark Elves by the end of the game as it turned out, as Linus’s Casualty dice were on fire! Glow managed the awards ceremony excellently, awarding Linus the best U16 trophy first, which led him to think he had come 5th, because with only 3 games there were a few coaches on 3 wins. But with the joint best opponent score, and the best combined TD and Casualty score, Linus triumphed, winning his first NAF shield, in a field of 52 coaches! He also won an Amazon team, which I had wanted for a while but hadn’t been able to justify it to go with the other two Amazon teams I already have… Thanks to all the winners for letting him have the one of the four teams available that we didn’t already have, and Hawca for donating the Apes to Alex as well! As for the rest of us, Alex took Goblins, lost all 3, but caused 9 casualties using illegal means (fouling, chainsaws etc); I lost to Jip in game 2, but won against Besters and Heartsbane. My first outing with Bretonnians, and will probably take them to NAFC. Callum took dwarves and lost all 3, but didn’t get the spoon, hurrah! Everyone had a great day, in glorious sunshine, with a massive playing field out the back for between-game entertainment, and excellent noodle lunch as well, thanks John! So yeah, great day, which raised a load of money for charity too (including from Nazgob’s painted team raffle!). Top notch Blood Bowl action. Alex did 4 of those SChWiNG casualties in our game…. 3 of them against his own team!! They all count baby, they all count! !